Supply Chain Management is the art of managing the flow of goods and services that involve the storage of raw materials, inventory of finished products, and the point of consumption is the primary function of an SCM. In short, it is the management that links the production, shipment, and distribution of a product. It covers everything from manufacturing to product delivery with all the underlying information pertaining to the product. It is a connected network of individuals, organizations, resources, and a score of technologies involved in the process. To understand the importance of SCM, let us take McDonald’s, one of the largest fast food company worldwide based out of United States have a number of raw materials to be ordered in to cook and serve their customers. The traditional supply chain method was obscured by human errors and loss of products. This is where an efficient SCM comes into play. LF (Li & Fung) logistics is one of the biggest supply chain company spanning all over Asia partnering with almost 400 renowned companies. They have also partnered with McDonald’s for providing the supply chain process and has faced various issues concerning the delivery of the products and invoices. In the traditional method of SCM, McDonald’s has fallen short of receiving the placed order that went below the reordering point. In a critical situation where it results in the safety stock becoming depleted. This has dire consequences in the form of receding customers. These issues need had to be resolved immediately. This is where automated supply chain management of Blockchain App Factory came into play. LF Logistics and McDonald’s (Thailand) under joint effort came to us in need of a solution to overcome all the roadblocks mentioned above. The team at Blockchain App Factory suggested an automated Supply Chain Management system that can be customized for their requirements. 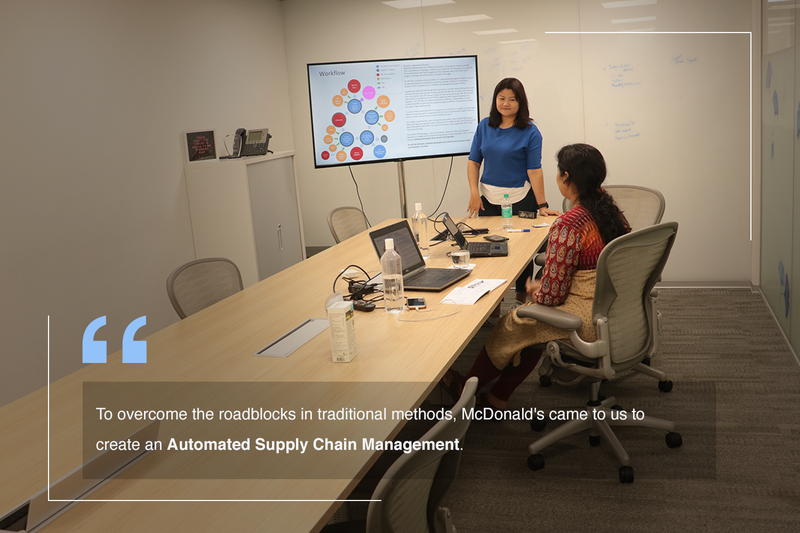 We had brainstorming sessions and after discussions on their requirements created a supply chain management that was tailored to their needs. Li & Fung is a global supply chain manager, founded in 1906 in Canton and now headquartered in Hong Kong. As of 2017, Li & Fung employs 22,000 people worldwide for product design and development, raw materials and vendor compliance and distribution. Applying the latest Blockchain App Factory’s innovations in traditional supply chain management has set LF up back in the game, just when their competitor Maersk has taken Blockchain initiative with IBM.